On February 14, 2013, work began on a new $1.2 million station building, which replaced the 1962 era depot. The new station, which was designed in the Craftsman-style to better blend with the city's architecture, includes an improved lobby, artwork and larger restrooms. The new depot was primarily funded through a grant from the Federal Transit Administration’s Bus & Bus Facilities program, which was matched with more funding from the city. 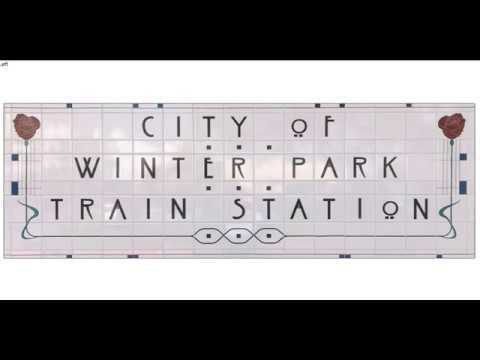 In addition to Amtrak, Winter Park station serves as a stop on the SunRail commuter rail system. Operations began on May 1, 2014. Unlike most SunRail stations, which feature canopies consisting of white aluminum poles supporting sloped green roofs, Winter Park's canopies have traditional white gabled roofs. It also includes ticket vending machines, ticket validators, emergency call boxes, drinking fountains. 1) Obtain the "Amtrak Winter Park PAX Station Platform N Scale" item. This is the stand alone passenger platform. 2) Obtain the "Amtrak Winter Park PAX Station w/o roof N Scale" item. This is the passenger station building including the wrap around pergola. It does not include the passenger station roof for those who wish to lower the model cost and create their own roof. See item 4. 3) Obtain the "Amtrak Winter Park PAX Station Roof N Scale" item. This is the roof for the passenger station building. It also includes the cupola at the roof peak. 4) Obtain the "Amtrak Winter Park PAX Station Cupola N Scale" item. This is the cupola that sits atop the passenger station roof. It is for those who wish to model the roof themselves. See item 2. _____Note: This model is not exact scale. It was drawn with the help of some measurements of some of the columns and windows along with some excellent photographs by an interested party. The scale of many of the details are also out of proportion. This and other considerations were necessary to enable a viable 3d print and so that the model would hold up to the vigorous post processing routines by Shapeways.